Ongoing Fundraiser Drive on Facebook! The Gates Foundation to Match All Donations on #GivingTuesday up to $1000! Embrace Your Cake Is Happening Right Now! 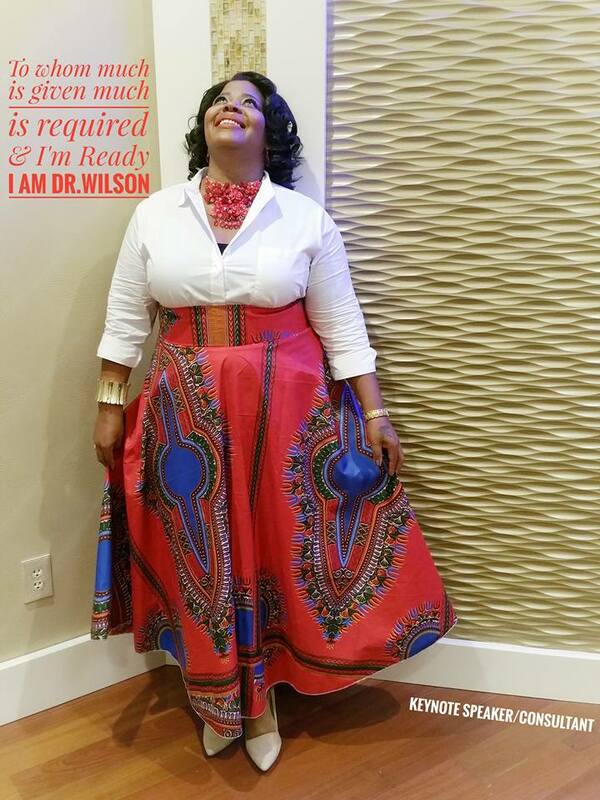 Happening at this current hour, our Executive Director and Founder, Dr. Jacquelyn Wilson, is Embracing Her Cake! Dr. Wilson is today’s keynote speaker, where she is delivering a powerful an d inspiring word to all those in attendance. Are you embracing your cake? Are you living your best and authentic life right now? If not, what is stopping you? Perhaps you need some guidance to help form a clear picture in your heart and mind. Consider contacting Dr. Wilson for a consult. 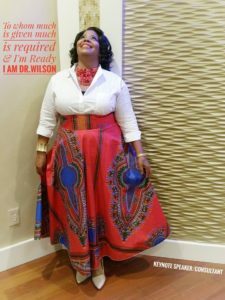 Be sure to inquire about having Dr. Wilson as a keynote speaker, workshop facilitator, or a one to a three-day conference. For information on what to expect and what Dr. Wilson has to offer, please contact ruemcdonald@gmail.com for an informational packet. Be certain to put; Information Packet Request for Consult, in the Subject line. As always, please be certain to check out our giving back page and click the donation button. No gift to small or large. We appreciate all that you do in becoming a part of our campaign, to help homeless women and young girls. It is because of you, that we are. Blessings! Saturday, December 10th, 2016 is going to be an absolutely wonderful and life changing event for those who are connected to #Surpristhestruggling™Inc. Our esteemed founder and Executive director, Dr. Jacquelyn Wilson will be in attendance, accepting, on behalf of our organization, a charitable blessing on behalf of the fundraising Brunch held by, POYED by Velvette’s Pinking of yOU Events & Design, LLC. 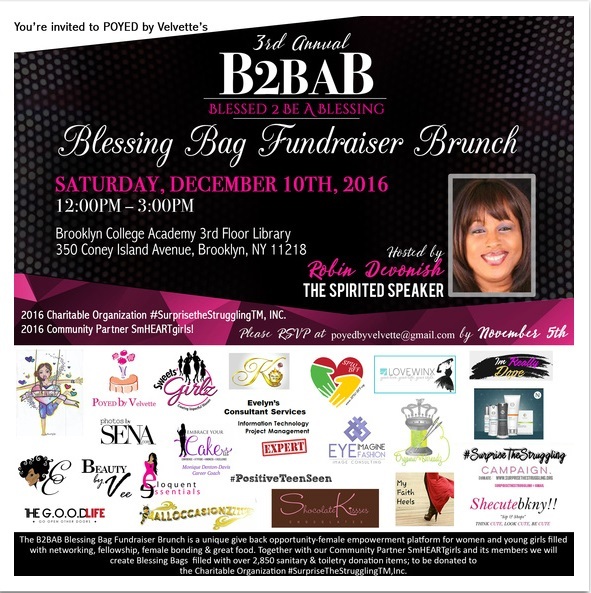 and their annual B2BAB – Blessing Bag Fundraiser Brunch. What an honor to be this year’s recipient of such magnitude. Many women and young girls will be blessed this holiday season because of the efforts of POYED and it’s community partner, SmHEARTgirls, and every other woman, man, organization that contributed to this year’s event by way of donations and sponsorships. It is truly an honor. POYED by Velvette’s Pinking of YOU Events & Design, LLC. The B2BAB Blessing Bag Fundraiser Brunch hosted by the Robin Devenish—The Spirited Speaker, is a unique give back opportunity-female empowerment platform for women and young girls filled with networking, fellowship, female bonding, and great food. Together with the 2016 B2BAB Community Partner SmHEARTgirls and its members, we will create Blessing Bags filled with over 2,850 sanitary and toiletry donation items; to be donated to the 2016 B2BAB Charitable Organization #SurpriseTheStruggling™Inc. Come out and meet our founder, Dr. Jacquelyn Wilson! October 22, 2016, from 9am-4pm at The Long Island Marriott, Uniondale, NY. 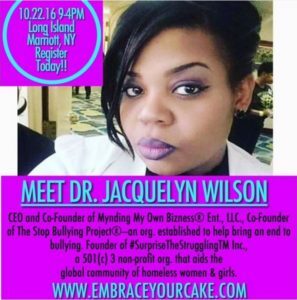 The Keynote speaker for Embrace Your Cake’s “Position Yourself to Win” Launch Event and Conference. Purchase your tickets today! Women from all over the country are getting their tickets for this launch event! You can purchase your event tickets at www.embraceyourcake.com Seats are limited! Reserve your seat to hear from Dr. Wilson and other amazing women on October 22nd, 2016 in Uniondale, NY! Come and meet some phenomenal women and speakers that will change your life, and help you to position yourself to win in every area of your life! For more information, visit: www.embraceyourcake.com Hurry! Seats are filling up quickly. Join Us For a Day of Giving Back! Join us on August 13th, 2016. 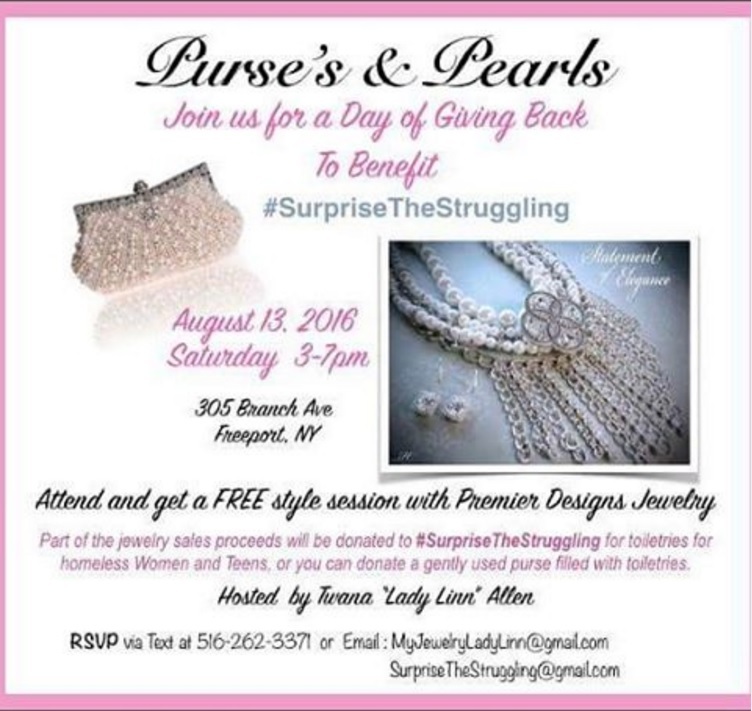 #SurpriseTheStruggling™ Inc. and Purses and Pearls to benefit homeless women and teen girls. Sponsored by Premier Designs in Freeport, NY. Come and join us for a day of giving back to benefit #SurpriseTheStruggling™. Attend and get a freestyle session with Premier Designs Jewelry. 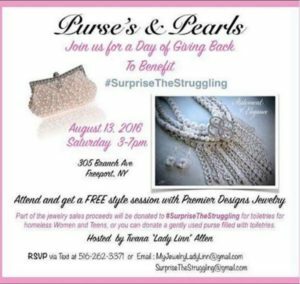 Part of the jewelry sales proceeds will be donated to #SurpriseTheStruggling™ for the purchase of toiletries to help further benefit homeless women and teen girls. If not purchasing jewelry that day, you may donate a gently used purse, filled with toiletries. The event will take place on August 13, 2016, Saturday, from 3:00PM- 7:00PM, at 305 Baruch Ave., Freeport, New York. Event to be hosted by, Twana “Lady Linn” Allen. Remember: It’s a blessing to be a blessing! Looking forward to meeting you there! Do you want to know what’s on our CEO’s mind? Do you want to know when and where our next event is? Or how our previous events turned out? Then be sure to check back weekly for our Blog updates to keep up with the current events of #SurpriseTheStruggling™ Inc. In February 2015, there were 60,484 homeless people, including 14,386 homeless families with 25,105 homeless children, sleeping each night in the New York City municipal shelter system. Families comprise nearly four-fifths of the homeless shelter population. For the first Quarter of 2016, based upon Shelter Census’, there are at least, 35,000 homeless adults, and 22,000 homeless children. Single adult shelters reported, nearly 4,000 homeless women and nearly 10,000 men. Shelters with families’ census show about 12,000 families, 17,000 adults, and nearly 23,000 children. These statistics only account for those who have actually made it to a shelter. It does not take into account the number of homeless that are currently without shelter and live on the streets, or in their cars. Also, we can note that there are a number of nursing homes that are either closing their doors or raising their costs, leaving many nursing home bound patients homeless. There are only three woman’s shelters in NYC that help only women. And there are approximately only two specific group homes for teen girls, while the rest of the group homes cater to both sexes. Let’s do all that we can to help those who are in need.